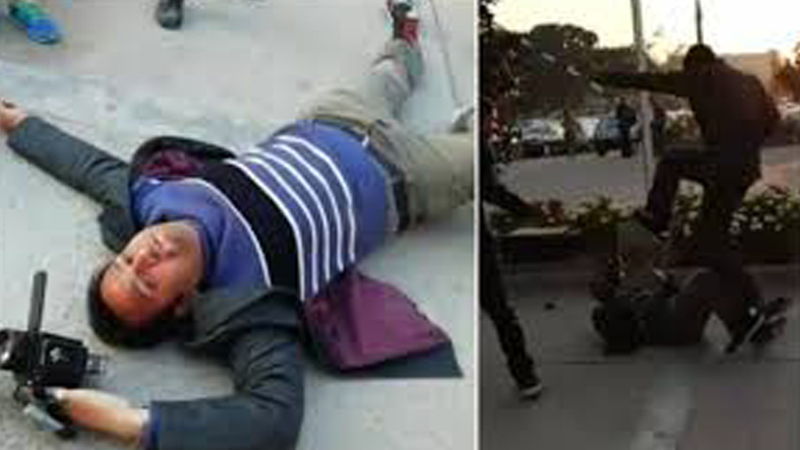 ISLAMABAD: A cameraman belonging to a private television channel was injured Monday when he was attacked by former prime minister Nawaz Sharif’s security guards, a private TV channel reported. The video footage of the incident shows Wajid Ali, a cameraman working for Samaa TV, filming Nawaz Sharif as he was leaving the Parliament House when the security guards attacked him. The video shows the guards chasing the cameraman who ran to save himself but was eventually overpowered and brought to the ground with kicks to the face. The cameraman was bleeding from the nose and mouth and shifted to the Poly Clinic hospital in an unconscious condition. Later, journalists caught one of the guards before he could escape and handed him over to the Parliament House security. Another guard managed to flee. Journalists held a protest sit-in outside the parliament building against the incident, blocking Parliament’s Gate No1 entrance. They also stopped the vehicle of Information Minister Fawad Chaudhry and vowed to continue their protest until the arrest of the security guard involved in the episode. Meanwhile, National Assembly Speaker Asad Qaiser barred private security guards from entering the parliament. He said in future, no one would be allowed to enter the parliament’s premises along with security guards.”No matter how influential a leader is, he must leave his security detail outside the parliament,” he said.He also ordered registration of an FIR against the security guard involved in the media person’s torture. PML-N spokesperson Marriyum Aurangzeb called on the injured cameraman Wajid Ali in the Polyclinic Hospital. “The PML-N heartily respects the press and media fraternity,” she said, apologising on behalf of her party. Information Minister Fawad Chaudhry strongly condemned the incident. He said Nawaz Sharif was no more in power but his Mughal mindset had not changed. “He did not bother to stop despite the fact that the poor cameraman was badly injured. He should not invoke the poor people to curse him further,” he added. Published in Daily Times, December 18th2018.